We’ve always been a fan of cruising and over the last few years have been on a few with the kids. 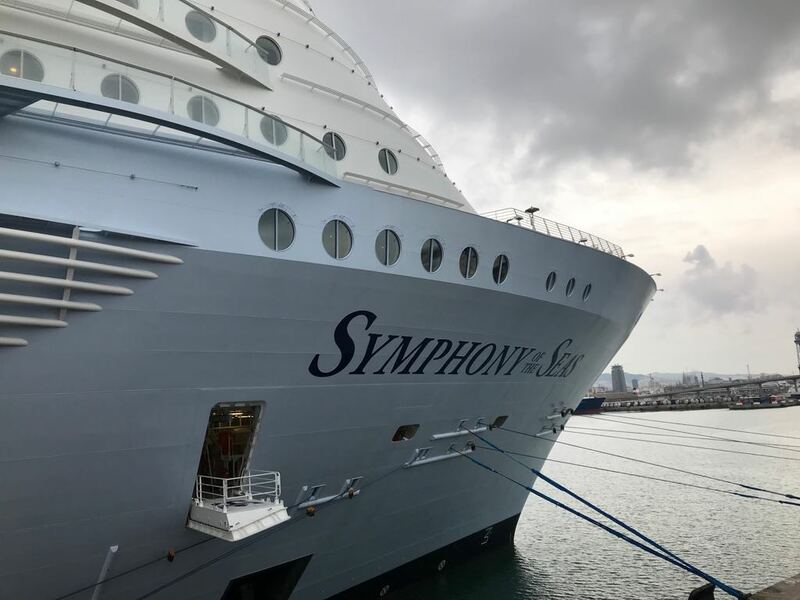 When we heard that Royal Caribbean, one of our favourite cruise lines, were building the biggest cruise ship in the world, Symphony of the Seas, we were desperate to give it a try. As soon as we heard that the ship would be doing its inaugural season in the Mediterranean, we knew we had to go! We booked the cruise through Bolsover Cruise Club, who we’ve used quite a few times to book cruise holidays. Often they can get you better deal than if you book directly with the cruise line. Flights were booked separately and we flew with Ryanair to Barcelona, which is where we picked up the ship. We flew to Barcelona the day before the cruise and stayed overnight. We’ve never been to Barcelona before and we had a great time. I’ll try and do a separate post about our 24 hours in Barcelona and will add a link here once it’s written. After our stay in Barcelona, we took a short taxi ride to the port. As we got closer to the ship, we were all impressed with just how big the boat was. We couldn’t wait to get onboard to explore! The Symphony of the Seas in part of Royal Caribbean’s Oasis Class fleet and is currently the world’s largest cruise ship and weighs in at an impressive 228,021 tonnes (if you’re in to that sort of thing). It can accommodate 6,680 passengers, 2,200 crew members and has 18 decks. As soon as we were onboard, we were in awe at the size. When you board the ship, you walk straight into the Royal Promenade, which is in the middle of the boat and has shops, bars and restaurants. We had a quick look around and then heading to our cabin to drop off our hand luggage bags. Our other baggage was checked in at the port and would be delivered to our cabin later that day. We were really impressed with the modern décor. I was also really pleased that the twins would be sleeping on a sofa bed rather than bunk bed style beds that come out of the cabin ceiling at night, as most is the case with most cruise lines. Oscar was staying in my mum and dad’s cabin, also on a sofa bed. The only negative, is the lack of storage space. It was just about ok for a week, but if we’d been on for any longer it would’ve been a struggle. We were staying in an interior cabin, which is one of the cheapest. I’m sure if you opted for a larger cabin this probably isn’t the case. On the ship there were a selection of places to eat that were included in your cruise price, these included the main dining room, the Windjammer buffet, the Solarium Bistro, Sorrento’s Pizza, Park Cafe, Cafe Promenade and El Loco Fresh. As well as other restaurants, where you paid an additional supplement, these included Jamie’s Italian, a sushi restaurant, a steakhouse and a seafood restaurant, amongst others. In the day we would either go to the Windjammer buffet or the Central Park Cafe. I really enjoyed the lighter breakfasts and amazing salads there. I often find dining at the buffet can be a bit chaotic when you’ve got three kids who all need sorting. By the time you get round to sitting down to eat your own food, they’ve nearly finished and start getting restless! Every night we tended eat in the main dining room where we would choose from a set menu. The kids also had their own child’s menu to choose from, although ours often selected from the main menu. Dishes included fish, lamb, steak, pasta and there was always plenty of choices. One of the things I really love about cruising is the formal nights, where most people get dressed up. It’s great seeing everyone in their finest when going to dinner. Whilst the food was lovely, I still prefer the rotational dining that is offered on Disney cruises and I think Disney’s food just has the edge on that offered by Royal Caribbean. I suppose it’s important for Disney to keep the adults happy as well as the children and I think they do that through going the extra mile on the food in the main dining rooms. This was also the first cruise we’ve been on where all three kids went to kids club. Sometimes we struggled to get them out as they had such a good time. The staff were brilliant and the facilities amazing. The even had dedicated arts and crafts rooms and a science lab! The added bonus is that all of the kids clubs are free until after a certain time in the evening. I must admit it was really nice being able to chill out by the pool or relax in the adult only solarium. There were so many activities to choose from, running both day and night. Some activities were included, these included the evening shows in the Theatre, include Hairspray, which I actually didn’t enjoy that much, the aqua shoe Hiro, which was fantastic, Lazer Tag, ice skating, various talks and demos around the ship and activities around the pool. As we are Diamond members of Royal Caribbean’s loyalty programme, Crown & Anchor, we got access to the Diamond Lounge. We would often visit the lounge before dinner for complimentary canapés and drinks. The kids were made welcome and they really liked the chocolate dipped strawberries that were often available. On this cruise there were lots of ports and only one day at sea towards the end of the cruise. With this in mind when we docked in Palma, the day after we arrived on board, we decided not to go ashore and instead spend some time exploring and relaxing on the boat. We decided to get a taxi and head into the centre of Marsielle and I’m really glad we did as it’s beautiful. There are a number of bars and restuarants, all set around a huge marina, known as the ‘Old Port’. The architecture is lovely and there is a really lovely feel to the place. We decided to get the Petit Train de Marsielle, otherwise known as the ‘fun train’, which costs €7 for adults and €4 for children over 3. The train runs various routes and we chose route 1, which takes you up to Notre Dame de La Garde, passing along the seaside road. We all really enjoyed the train as you get to see lots of different places in a relatively short amount of time. We’d definitely recommend it. The tour returned us to the marina and we had a drink at one of the bars and did a bit of people watching, before heading back to the ship. From La Spezia you are within reach of Florence or Pisa. Simon and the kids haven’t seen the Leaning Tower before, so we had decided that we were going to head to Pisa. When we docked at La Spezia, we walked through the town to the main train station and got a train to Pisa, which is about an hour and a half away. It was nice to travel through the Italian countryside. When we arrived at Pisa, it was raining, so we jumped on a bus to take us to the Leaning Tower of Pisa, which took about five minutes. It’s definitely worth going to see. We took the obligatory photo’s and purchased some umbrellas and some souvenirs for the kids, from the stalls right near the Tower, which are really reasonably priced. We then headed back to the boat. It was quite a long day, particularly as we got of the train a stop too early and had quite a walk to get back to the boat; but it was worth it. Although we don’t often tend to arrange excursions direct with the cruise line, we thought it would be best to do a tour with the cruise, to ensure we would definitely get back to the ship in time. The tour we booked, was basically a coach trip. The coach took us to Rome and dropped us off. We had a few hours at our leisure to explore the sites, before getting back on the coach for a bit of tour before heading back to the boat. I love Rome. The buildings are beautiful. We walked everywhere and visited all the popular sites. We saw the Vatican, the Trevi Fountain, the Pantheon and the Colosseum. We left the Colosseum until last and unfortunately we didn’t get time to go inside as the queues were huge. I think if we went again we’d go there first. We ate pasta and pizza for lunch, with a glass of prosseco (when in Rome…) and generally had a really lovely day. It was hot though and we did a lot of walking, so were all exhausted on the coach journey back to the ship! We visited Naples a couple of years ago when we did a Disney Cruise. We went to see the Pompeii ruins and also visited Mount Vesuvius, as well as indulging in pizza. After all Naples is apparently where pizza was invented. As we’d had a busy couple of days beforehand, we decided to stay onboard the ship again. We could see Mount Vesuvius from the boat, which the kids really liked and we decided to spend the day by the pool and take advantage of the slides not being too busy. After Naples, we had a day at sea whilst we cruised back to Barcelona. We had an absolutely amazing time and could’ve easily stayed onboard for another week. I’m normally ready to get off after a week on a cruise, but not this time. The ship is so big and there are so many great bars, restaurants and activities and areas that there just wasn’t enough time to fit everything in. We’d love to cruise on the Symphony again. Following her first season in the Med, she’ll now be based in the Caribbean and we’re already looking at future cruises! Here’s a video from our trip. Oh WOW I would love to go on a trip like this, the ship looks amazing – big fan of the sofa bed rather than a bunk, that’d work better for us too. Ah I’ve heard amazing things about Symphony of the Seas! I have to admit that I’m not a massive fan of the idea of cruising but seeing posts like this really make me change my mind.